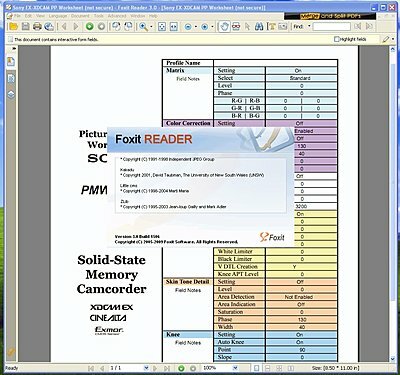 I use Foxit Reader for pdf's. FWIW, I use Foxit Reader too and get the same password problem. 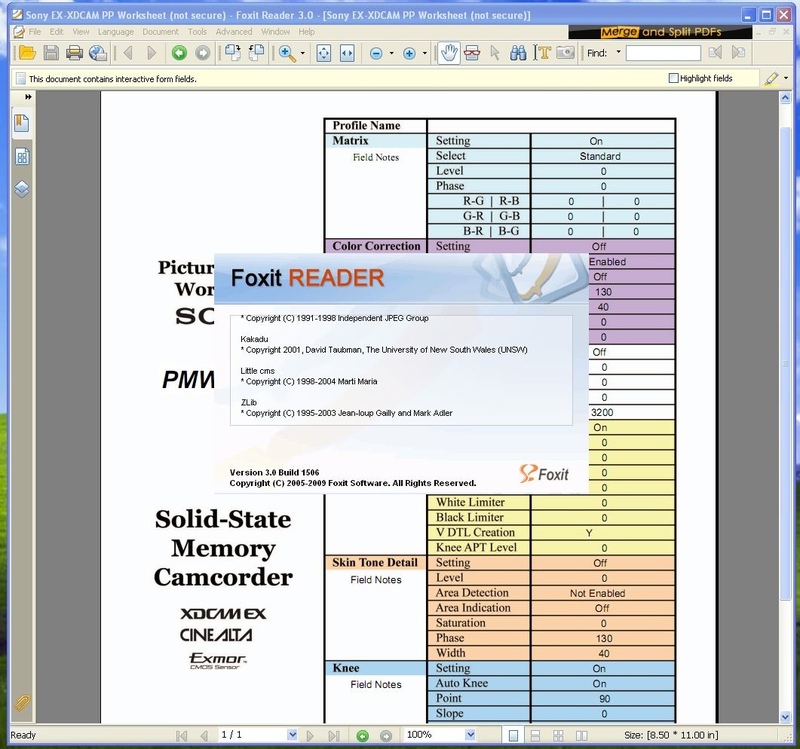 John, I just installed FoxIt Reader 3.0 Build 1506 in XPSP3 and it opened the "Adobe Version 7 or higher" pdf without any problems and without asking for a password. It actually permits the use of Form Fields but without initially revealing the pull-down buttons until you select the field. BTW, the EX3 field is default so it can be set to show the EX1 mode. Gaaads, it even reveals the tool tips. Go Figure! The choice to not use Adobe's product is yours to make, in which case use I can only suggest you use the Excel Spreadsheet or create your own using FoxIt Creator. Cheers! Just checked, I'm using v3 build 1120. Ok, I'll go download the latest Foxit Reader and give it a try. Thanks for the info. My attempts for open failed also. I opened the xls and saved it as a Numbers file for those Mac users with iWork. Why is Picture Profile management so Complex? Anyone with a mathematics background immediately recognizes that managing Picture Profiles cannot be done with a one-dimensional presentation in a simple text document. 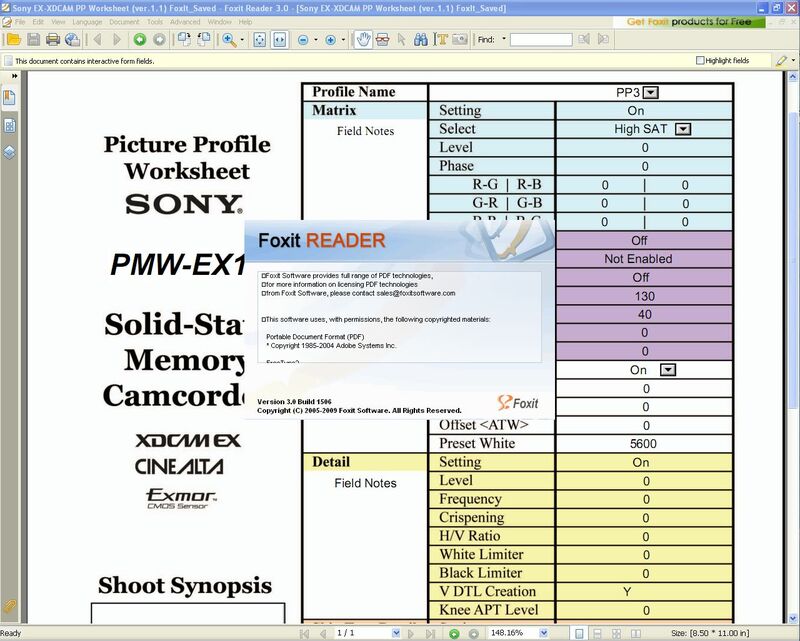 Sony’s camera manual as such is a linear one-dimensional presentation of Picture Profile functionality—it merely provides the raw data. The camera manual does not in any way provide a hint of how to apply picture profiles in the real-world, nor does it attempt to describe possible outcomes for end-user Picture Profile variations. At the very least, what is needed is a simple tool that can manage the multi-dimensional nature of the complex Picture Profile equation. There is also a need to consolidate Sony’s White papers and the collective wisdom of a select few so that end-users can attempt to understand the possible effects of using Picture Profiles in our real-world video footage. This latter need is a separate matter. The first priority is to obtain an effective management tool for Picture Profile possibilities. d) Allow the end-use to keep track of “subjective field notes” for function variations. Hence, I have provided one approach to manage the complex nature of Picture Profiles without having to tediously consult the camera manual. I have done this with Adobe’s Acrobat document management tool. I am confident that with all the talent, creativity and time of individuals in the EX-XDCAM forums that there is room for innovation and other approaches to the problem. Please keep your solution to a one page 8.5x11 document and as a minimum provide the same functionality for both Mac and PC computers. P.S. Added a field to enter a synopsis of the shoot as well as for the Picture Profile number. Last edited by Barry J. Anwender; April 28th, 2009 at 03:23 PM. I just downloaded and installed FoxIt Reader 3.0 Build 1506 and when I try to open your pdf file I still get asked for a password. WTF!!! Indeed there seems to be nothing more to offer. I just opened Barry's .pdf on a Macbook Pro using Adobe Reader 8 and it was fine. Something like this would also be useful for the new JVC HM700 scene presets. However I certainly couldn't build a thing of beauty like this from scratch. Very sweet. Thank you Don and Sean. Apparently Sony Picture Profile innovations are a hot-potato as also evidenced by some of the discussion in the recipe forum. It is nice to hear some appreciation. My only hope is that it can be useful tool for those of us who are learning/trying to use picture profiles to get the most from our cameras. Cheers! Works OK for me. Initially I expected it to allow all PP settings to be stored on the sheet in electronic form, but really much more useful to print out a sheet for each PP. Which is obviously the intent. Thanks. Serena, unfortunately Adobe Acrobat is required to save an electronic form and of course print it. Adobe's market differentiation from the free Adobe Reader. I did discover that the freeware FoxIt Reader on the Windows platform does allow one to set the Form Fields, to save and print the electronic form. Unlike one poster above, the FoxIt Readers opens the Worksheet properly on my machine at least. Perhaps because I had previously installed the Adobe Reader 9.1. So it may be that combination of the two installed apps is what enables FoxIt to provide full functionality. Here is the worksheet opened in FoxIt, modified some of the fields, then saved from FoxIt and reopened in FoxIt. Barry, I just wanted to thank you for taking the time to produce this and give it to the EX community. I didn't have any problems using it with Acrobat Pro 9 on the Mac, which I have, so it worked quite well for me. 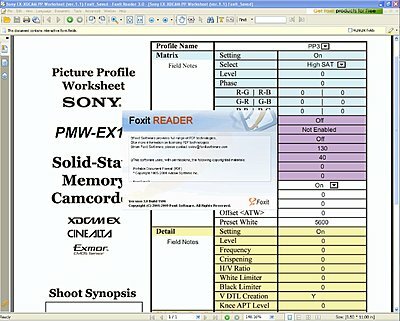 I think there is probably a way to get the the Acrobat Pro PDF functionality into Excel, such as drop down menu and cell comments that you've added to the PDF, which might make the tool more universal. However for me it's fine as it is, no extra work required for me. For me it was great because I was just thinking of creating a Excel sheet to store my settings so I could easily compare and archive settings. I did a quick search and your tool came up, and I was able to use it immediately for what I needed and it was quite helpful.